The 2009-2010 concert series of Buffalo’s excellent purveyors of small ensemble delights (chosen by its visionary artistic director Charles Haupt) got off to a resounding start in the welcoming confines of the Peter and Elizabeth C. Tower Auditorium. What better way to simultaneously begin another RendezBlue and celebrate the first anniversary of the Burchfield Penney Art Center. By making that space available to this top-notch, risk-taking organization, the Center does both its patrons and the musical community-at-large a mutually-beneficial service. Here’s to more arts organizations (large and small) having the same wisdom and determination. Those unfamiliar with Smit’s work might find it difficult to believe that the same man wrote the piano trio, piano solo, song cycle, then (thanks to a digitally remastered recording by the legendary producer, Thomas Frost) performed Pete Johnson’s Zero Hour with exceptional skill and stylistic flair. Like Paul Hindemith, Smit proved conclusively here and in other recent reviews (cross-references below) that he is assuredly a composer’s composer. That wee bit of jazz was preceded by the first cycle of six which comprise Smit’s last major work: The Ecstatic Pilgrimage. “Childe Emilie” (14 songs about memories & fantasies of childhood) is a marvellous journey through Emily Dickinson’s thought-provoking poetry coloured with meticulous care and shared experience as the composer finally found a soul mate whose words struck and inspired so much more than chords. Soprano Amanda DeBoer made a valiant attempt at bringing these wonderfully rich recollections to life. Her ability to word-paint (notably “The hungry Vulture screamed” from “Through lane it lay - through bramble -”) was at one with text and tones yet a few uncentred pitches provided more feelings of unease than intended. Claudia Hoca’s accompaniments were models of support and remarkable for their easy-flowing legato and ring in the upper reaches. Only very infrequently did the piano over-power the voice. Nonetheless, the capacity audience showed their considerable enthusiasm for the result after “just a Crown” was put into place. Hoca was also the soloist in Dance Card. The multi-homage suite should become fodder for a choreographer or in the case of “Prater Rag” (no threat to Joplin’s oeuvre but highly inventive nonetheless) a film constructed around the complete work. “Tango Bolshoi” was stylishly and moodily rendered even as the inner voices were given their moment to shine. The “Diabelli Polka” was beautifully voiced; “Valse Tristan” was the least successful writing with too many Tristans-past lingering in memory belying “just” the keyboard treatment. After the break, Jean Kopperud took the stage to perform “Abyss of the Birds” from Olivier Messiaen’s magical Quatuor pour la fin du temps. 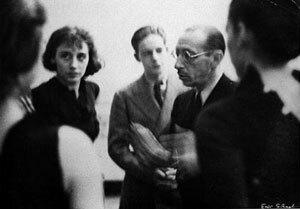 While the link of birds to the song cycle provided some artistic glue, perhaps Stravinsky’s Three Pieces for Clarinet might have better cemented the bond (Stravinsky figuring prominently in Smit’s development and career path). Kopperud dug in deep and held the crowd in rapt attention as the opening, slinky-silky lines unfolded. When fluttering up into the extreme range, her somewhat strident tone took no prisoners. A more wide-ranging performance couldn’t be imagined.